Surface electromyography technology (sEMG) is similar to an "ECG/EKG" (Elelctrocardiogram) that measures the electrical activity of the muscles of the heart. The sEMG test measures the electrical activity of the muscles that support the spine. The testing is painless and completely safe. It uses a hand held instrument for the Static sEMG assessment containing probes that are lightly placed on the skin over the muscles of the entire spine, and, electrodes (dynamic test) that are placed over the muscles of neck and lower back to identify the exact location of abnormal muscle activity. The hand-held device is capable of measuring minute microvolt changes, its sensitivity allows us to not only target symptomatic areas, but detect areas of concern before the pain starts (kind of like dentistry). Vertebral subluxation (spinal misalignment) will often cause muscles to "brace" or spasm in abnormal, characteristic patterns. The sEMG will measure these patterns, graphing areas of abnormally high, or low, contraction, as well as pointing out areas of imbalance. The benefits of this test are that it is painless and quick, taking approximately 3 -5 minutes to complete while the patient stands in place. And most importantly, it helps us determine what further evaluations or tests may or may not be necessary! Discover how you "measure up" to normal! You'll get to take a copy of your neck and back "picture" home with you! 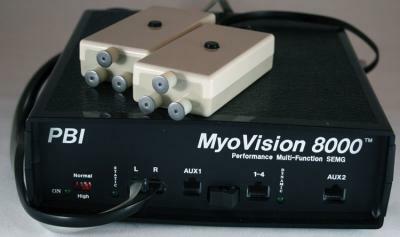 The MyoVision is the absolute latest and most high-tech tool available in chiropractic spinal analysis. What do the results of the MyoVision sEMG Exam mean? Originally developed for use by NASA (National Aeronautics and Space Administration) to measure the effects of zero gravity and fatigue on their astronauts, it has recently been shown to correlate with neurological reflexes that occur with injury. For our purposes, we are concerned with injury of the spine. Chiropractors specialize in the analysis, detection, and correction of vertebral subluxations or "subluxations" for short. The subluxation is the key problem to find and correct for the chiropractor, much like cavities are for the dentist. 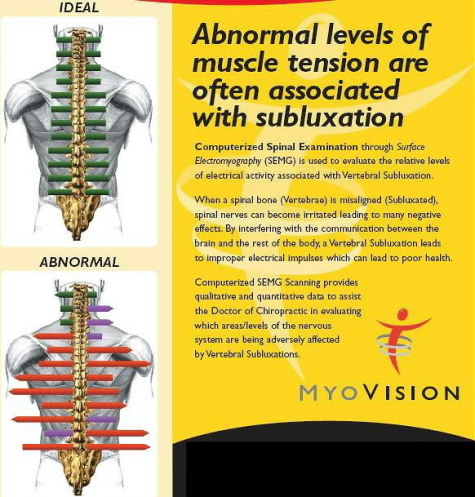 A subluxation is a misalignment of one of the 24 vertebrae of the spine causing nerve pressure and abnormal spinal mechanics (movement). Nerve pressure causes interference or alterations to the messages sent from the brain to the body and results in a decrease in proper body function. Decreased function may cause various health problems and symptoms. Since the nervous system controls every function of your body (either directly or indirectly) and regulates every muscle, organ and cell, it is important for your nervous system to be free of nerve pressure in order to enjoy optimal health. At Advanced Healthcare, Dr. Pisarek specializes in finding the areas of nerve pressure, muscle tension and the subluxations causing it. Using the MyoVision helps this process. What do the coloured bars mean? Colours indicate levels of muscle tension (spasm): average are green, purple are moderately high, and red are high levels of tension. Yellow readings indicate abnormally low or fatigued muscles, which may be a precursor to abnormalities. The arrows, if any, indicate an imbalance of muscle tone. 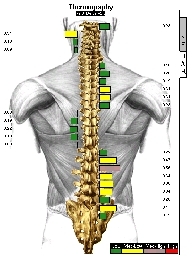 These imbalances can indicate the presence of a Vertebral Subluxation. When correlated with X-Ray and other testing we perform, the Static sEMG Test gives us additional information to help correct the cause of your symptoms. With muscle activity, abnormally high levels are displayed with a red bar under the "sEMG" portion of your scan and have a number above 7. Abnormally low sEMG readings can occur and are shown on the graph with a green bar below 3 (the normal contractile range is between 3-7). By combining the information on both portions of the scan we can get a pretty good idea about what is going on with your body. This allows us to correctly outline a customized treatment plan just for you. The image on the left is a static (standing upright and stilll) sEMG examination result PRIOR to chiropractic care indicative of an abnormal 'unhealthy' state. The image on the right is a static (standing upright and still) sEMG examination result AFTER chiropractic adjustments were administered, indicative of a near-normal 'healthier" state. In essence, what this test does is measure the amount of muscle activity (or inactivity) going on within a particular group of muscles. If problems are long standing, abnormal muscle fatigue will be displayed in the graph. If problems are more recent, it will show up as abnormally strong, or in spasm. Usually when a muscle has spasms it is to protect a weakened joint and/or nerve. This is due to the laxity (stretching) that occurs in the damaged ligaments that hold the spine in place. Ligaments are somewhat elastic, much like a rubber band. If you have ever stretched a rubber band too far you noticed that it either broke or lost its normal ability to rebound back to the same level of tightness. In your body, the brain notices this loss of elasticity and the instability to the surrounding joints by creating muscle spasm to provide support and protection to these injured and loose areas. These abnormal patterns in muscle activity can give solid evidence that there may be nerve irritation. Both chiropractors and medical doctors have performed a tremendous amount of research to validate this fact. Once the sEMG static scan is complete, the computer deciphers and interprets the information and displays it in a graphical format that is easy to understand for both the doctor and the patient.